The novelty of being published has not worn off, even after spending more than half my life writing for newspapers, magazines and websites. But appearing in a book was new and exciting. And to have my name near that of my beloved Saucee Sicilian made that victory all the sweeter. 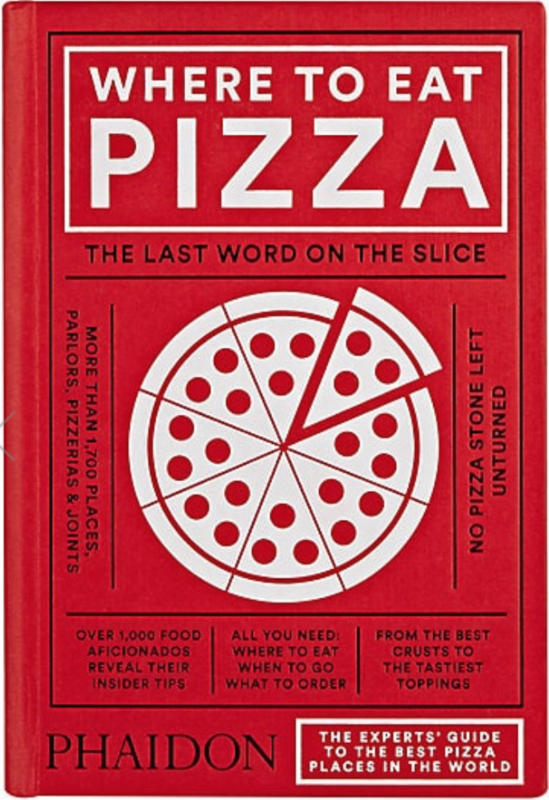 If you happen across a copy of “Where To Eat Pizza,” you will find me buried in Oklahoma (where my body will be interred in the near future, I assume) with a few of my favorite pizza places. The makers of the book contacted me and asked if I would nominate a few spots. The first one that came to mind was The Saucee Sicilian. 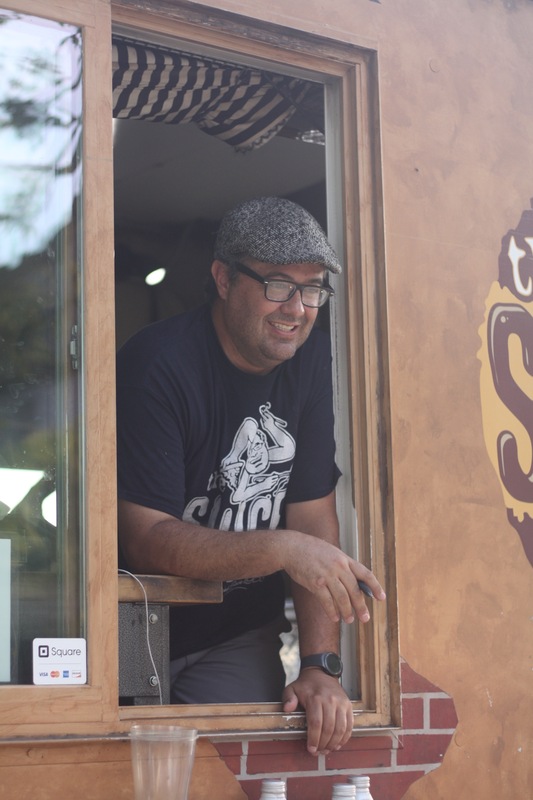 The food truck is run by Gannon Mendez and his mother Priscilla “Nonna” Jones. The only thing they do better than wood-fired pizzas is dirty jokes, which are especially fun when spouted by Nonna. Give me a kindly grandmother with a sailor’s mouth any day. Gannon Mendez. Not pictured: Legions of screaming fans. If there’s one thing that frustrates me about the Sicilian, it’s that its mobile nature makes it hard to predict when I will next get to eat a straight-from-the-oven pie. But that’s not likely to stay a problem for long. 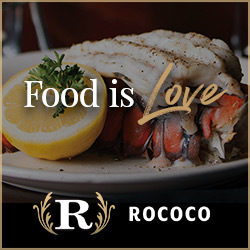 Rumor has it the truck will soon expand into a brick-and-mortar restaurant. And since the rumor came from Gannon, I give it a lot of weight. The other frustration, as long as I’m venting, is the line. I like to show up early for my Saucee fix, but if I’m not right on time, there’ll soon be a line of hungry patrons waiting to order. A short wait is a sacrifice I’m more than happy to make for pizza this good. When Nonna tells you to eat her balls, she’s (probably) talking about Sauce & Balls ($7). But maybe not. Nonna is a free spirit and you’ve got to let her fly. Regardless of her exhortations, I would recommend you get an order of her hand-rolled meatballs in a hearty red sauce. The texture and the taste are unbelievable. Meatballs are one of the most difficult dishes to master, in my experience. All too often, a homemade meatball will be tough and dense — the product of too much handling. It’s one thing to leave hamburger meat alone, but there’s a certain amount of mixing required to infuse meatballs with flavor, making these all the more impressive. The sauce is a two-day endeavor and it sells FAST. Fork a ball into your mouth and you’ll see why. 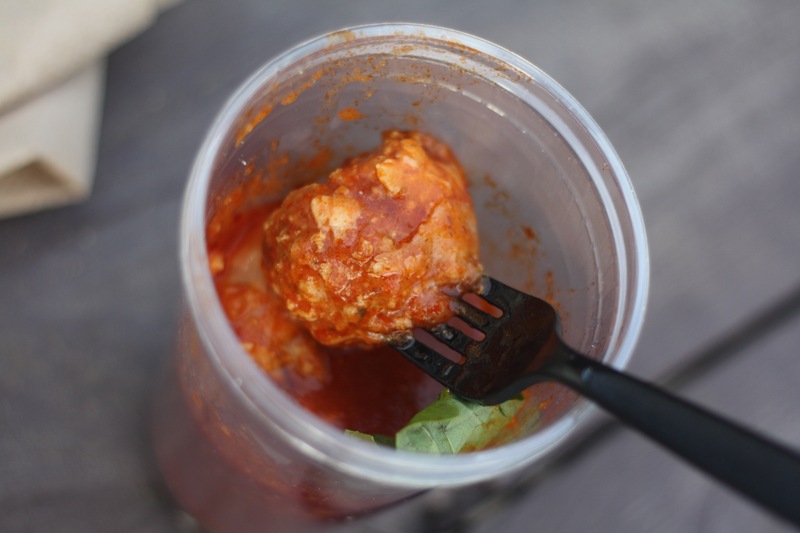 The lightly packed spheres soak up the sauce, giving each bite a burst of summery tomato flavor and rich, fatty Italian meat. Good lord, y’all. Good. Lord. But if you’re lining up for the Sicilian, you’re going to want a pizza. Prices run from $8-18 for pies, which are enough to feed a normal person or to whet my appetite. When I’m with my kids, that means the Syracuse ($8) and the Catania ($9) — a cheese pizza and a pepperoni pizza, respectively. These aren’t blow-you-away pizzas, but if you’re trying to please people who don’t like a lot of heat or spice, this is what you must do. Likewise, I have been told My Big Fat Ex ($18) is an obligatory “supreme” pizza and one that isn’t a vital addition to your pizza repertoire. BUT! Here in the middle, that’s the sweet spot. It’s where you get pies like Mt. 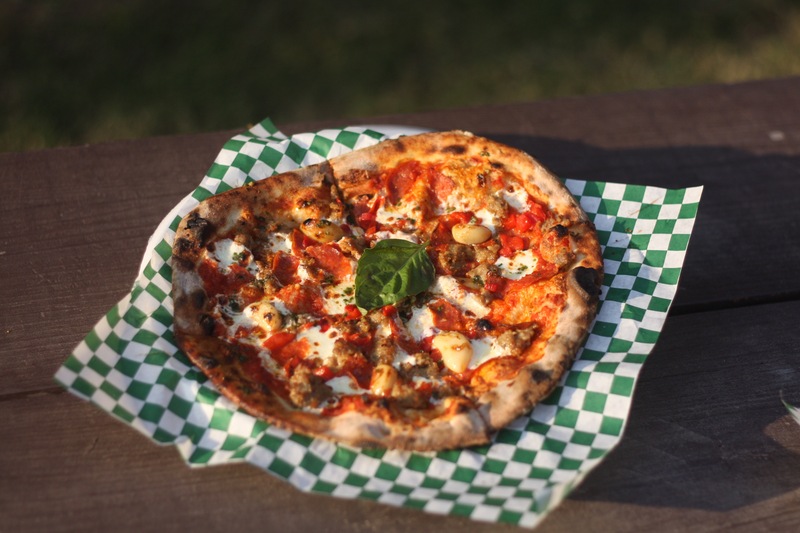 Etna ($11) with creates a volcano of flavor with a ring of pesto surrounding an island of red sauce, covered in mozzarella and dotted with roasted garlic cloves. It’s damn good. A word, if I may, about Saucee’s crust. This is doughy magic. Each slice has a crispy outer edge and enough gumption to hold up the pile of sauce and toppings, but the true draw is in the bite. There’s a glorious chewy pull that comes from a quick, high-heat cooking. You’ll gnaw a bit. You’ll work. And it just means you’ll spend more time tasting it. For all the other things Saucee Sicilian gets right, the crust is absolutely integral to their success. 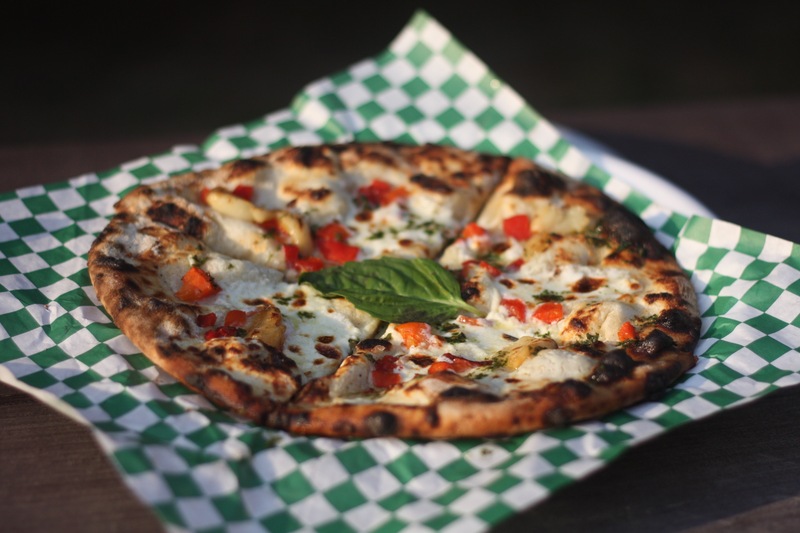 The Capizi ($11) is a white pie, with ricotta instead of red sauce, a bit of pesto, roasted garlic and roasted red pepper. It’s a milder taste, but very rich. It’s not a dessert pie, by any means, but I could definitely see relaxing on a veranda, nibbling this pizza and enjoying a glass of port, maybe mulling over foreign affairs or talking about fine art. The fact that I eat this pizza hunched over a picnic table and growling at people who get too near has no bearing on my dreams. Something you should know before we go any further: The Saucee Sicilian has a secret ingredient. And no, it isn’t love. Don’t be stupid. Mixed with their red sauce, the chili oil becomes a potent factor in my favorite pies. 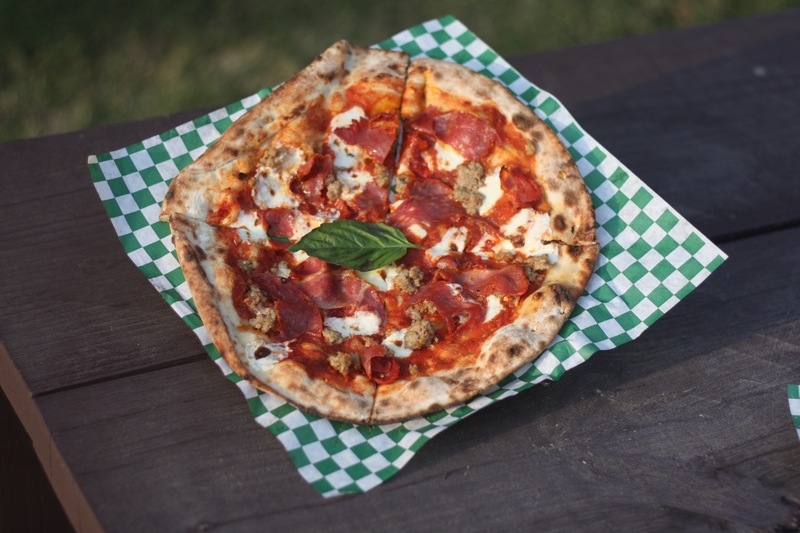 The Tusa ($12) has that spicy red sauce, hot capicola ham, hot soppressata sausage (kind of like pepperoni), Nonna’s sausage and mushrooms. Despite all the talk of heat, this isn’t going to burn you to your very core. Nobody has to chug aloe vera after eating this. But there is a lovely tingle on the taste buds with lots of decadent, chewy meats to enjoy. Chili oil isn’t standard on the Nota ($11), but it should be. That one has red sauce, cheese, soppressata, Nonna’s meatballs and roasted garlic cloves. The addition of chili oil bumps it up into must-have territory. Ask. They will grant your wish. 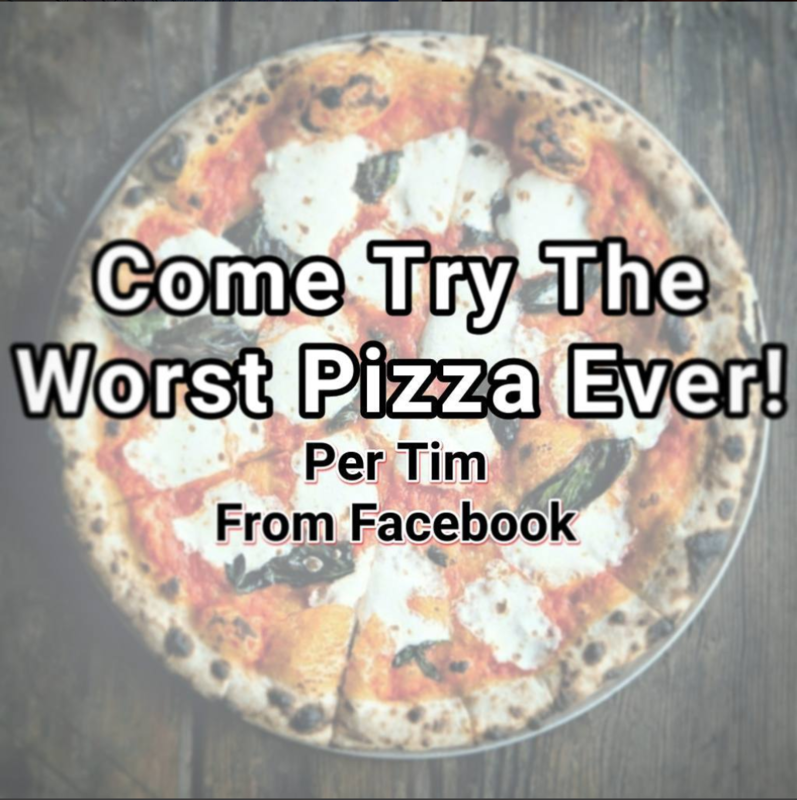 Not on the menu is the The Tim ($14), which has that lovely chili oil red sauce with a mix of chopped pepperoni, sopressata, roasted garlic, red peppers, meatballs and a splash of Nonna’s pesto with a layer of mozzarella and dabs of ricotta cheese. One warning: If you order a Meat Lover’s pizza on the regular, this will ruin that for you. Saucee’s pies are addictive, but this one is straight up boom-boom-pow flavorful and decadent and manly. I found chest hair growing on my elbows after eating this. Now, let’s all say a prayer that Gannon gets back to me soon with a list of Nonna’s dirtiest jokes, which I will share with all of you immediately.